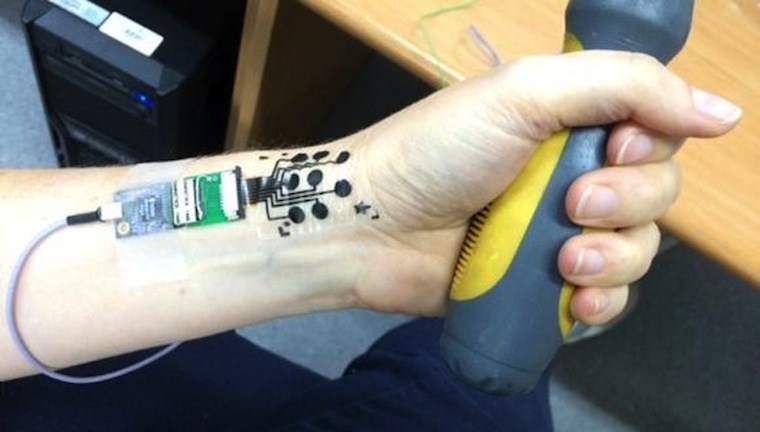 Electronic tattoo was developed at Tel Aviv University in Israel, it's a temporary tattoo that can monitor your muscle's activity, without inconvenience to the person wearing it. The electric tattoo is made up of a carbon electrode, an adhesive surface and a polymer coating. Moreover electronic tattoos don't stop at monitoring muscle activity, more variety of application can be developed such as map emotions based on facial expression, study neurodegenerative diseases, control prostheses and also as a diagnostic tool for Parkinson's disease.According to the Study leader Yael Hanein, an associate professor of electrical engineering at Tel Aviv University, the key innovation is making the electrodes extremely thin, making it more simple and convenient. With electronic tattoos, possibilities are endless.Want to know more about this awesome device? Follow this link!